We are indebted to the BBC for this fascinating story. Australia is rightly famous for its scary fauna – now it appears it might have been an even scarier place to inhabit in the distant past. 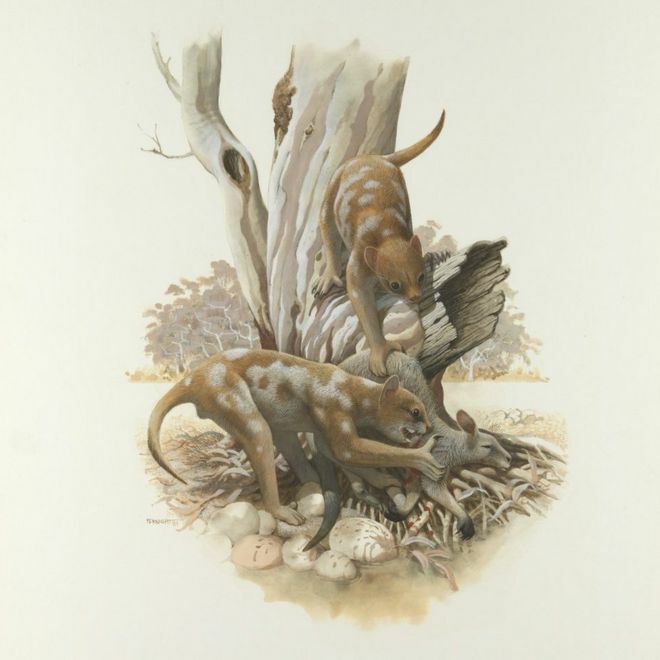 Source: Museum Victoria / Artist: Frank Knight An artist’s illustration of Thylacoleo carnifex, Australia’s marsupial lion. The discovery of claw marks in a bone-filled cave in Australia suggests an extinct, “anatomically bizarre” predator was able to climb trees and rocks, meaning it would have been a threat to humans, writes Myles Gough. 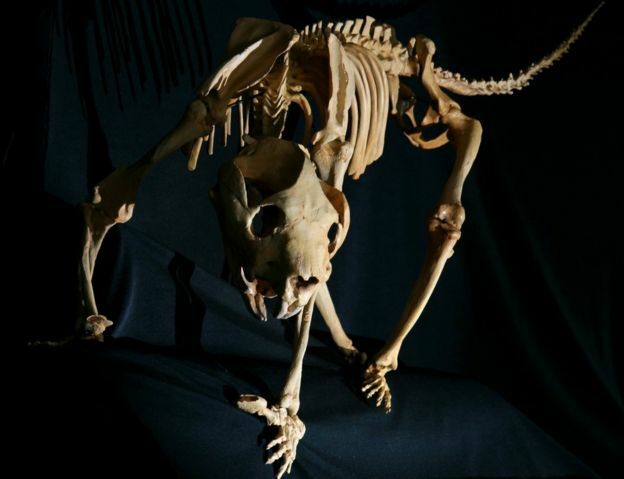 Apparently, Australia’s extinct marsupial lion, Thylacoleo carnifex, was the continent’s top predator at the time of human arrival 50,000 years ago. Weighing more than 100kg, the animal had sharp claws and a powerful jaw, and shearing teeth that could rip through the flesh of its prey, which included giant kangaroos, rhinoceros-sized herbivores known as diprotodon, and possibly early humans. But while experts agreed on the marsupial lion’s fearsomeness, whether or not they could climb rocks and trees has been a source of scientific contention. Some have speculated that the lions’ anatomy would lend itself to climbing, while others argued they would have been too heavy to clamber up to high places. 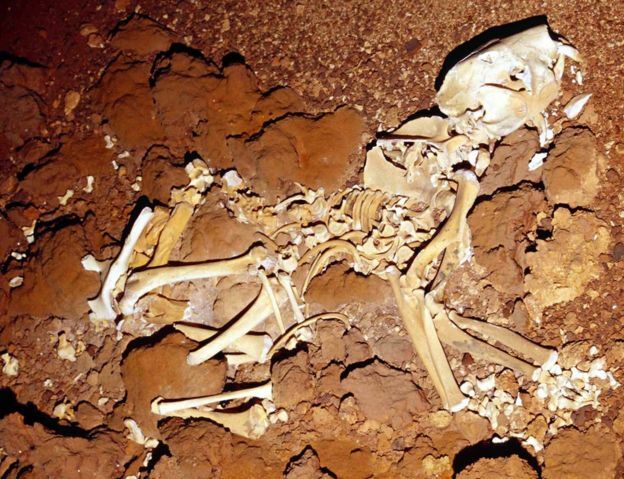 Now palaeontologists at Flinders University say they have found the answer in a cave in Western Australia where marsupial lions left thousands of scratch marks. The scratch marks, mostly made by juveniles and clustered on a near-vertical rock surface leading to a now-sealed exit, suggest two things about the lions: they were skilled climbers, and they reared their young inside caves. “[Our findings indicate] the [marsupial] lions were running up and down these rock piles to get out of the cave, and they weren’t using the lower-gradient, longer route,” says associate professor Gavin Prideaux, who supervised the research. “We can be confident now and say that they could climb. “And if they could climb really well in the dark, underground, there’s no reason they couldn’t climb trees. “They would have been a very significant threat to people when they first arrived in Australia. The team’s findings, which reinforce some contentious ideas about the behaviour of these “highly adapted” and “anatomically bizarre” predators, have been published in Nature’s open-access journal Scientific Reports. The claw markings were found inside the Tight Entrance cave near the Margaret River. In the mid-90s, bones inside the cave were identified as belonging to extinct megafauna, dating from 30,000 to 150,000 years old, says Prof Prideaux. Between 1996 and 2008, he went on numerous expeditions to the cave to collect fossils, and during that work discovered the scratch marks. “We had the feeling that they were probably Thylacoleo scratch marks, but we had to test it,” he says. Prof Prideaux and his honours student, lead author Samuel Arman, established a list of seven species of animal that could have been responsible. It included the extinct marsupial lion, as well as Tasmanian tigers and Tasmanian devils, which used to live on the mainland, wallabies, koalas, possums and wombats. Mr Arman left scratch pads inside zoos and wildlife parks, and collected tree bark to get sample claw markings from the living animals, which he compared to those inside the cave. 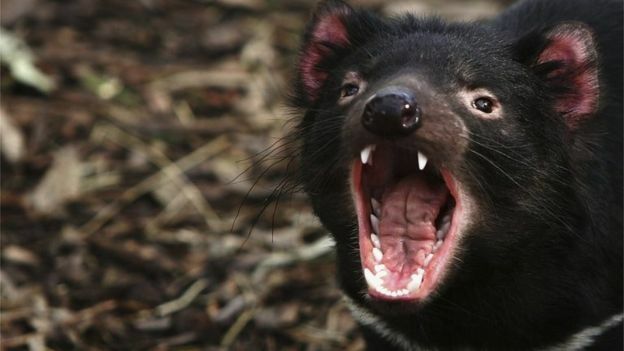 This helped the researchers narrow their list to two key suspects: marsupial lions and Tasmanian devils. But they needed another clue. Mr Arman also reconstructed a skeletal hand of the marsupial lion and made mock scratches on modelling clay that “perfectly matched” the large ones found in the cave. The animals, which went extinct around 46,000 years ago, lived all across the vast continent. Prof Prideaux suspects similar claw markings exist in caves elsewhere, but have yet to be discovered. 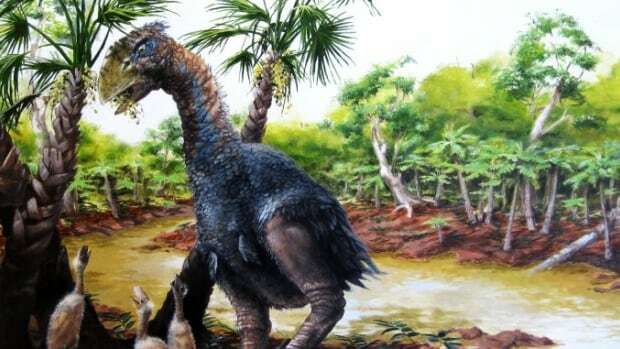 Dr Judith Field, an expert in megafaunal extinctions from the University of New South Wales, says “the methods used to determine the size of the animal making the marks appear well conceived and well executed”. We await more news with interest. Meanwhile, back to killing red-back spiders, swimming with sharks, being bombed by homicidal magpies, avoiding blue-ringed Octopuses, and staying away from Zika virus and Dengue fever -bearing mozzies. Sheesh. I wonder how it would have gotten along with these birds from Canada … We’ll never know, I guess, because they were far from contemporaneous. Indeed, the historical, even pre-historical inhabitants of the Australian continent, including some huge and impressive mammals that are mostly unseen in historical teaching is a fascinating subject. There were predecessors of kangaroos which were huge and muscular and monitor-lizards that could easily stretch from one end of a wide country highway to the other. In a cave to the south of where I live, tourists and curious Aussies like me can see, frozen in the wall, the skull of a very sabre-toothed tiger-like creature. This stuff is SO interesting and full credit to you for bringing this part of it to our attention. When examining the available data concerning countless crytids, I noticed that the Eastern Australian Marsupial tiger is one of the easier believed crytids. There are many many stories about it and it’s survival (like so many different lake-monsters and hominid crytoids). There are many sighting reports (which on its own means little to a well-read and experienced skeptic). Like the Tasmanian Tiger, there are a number of other existing species in the area which carry markings easily mistaken for those of the long-extinct subject of the many documentaries. Underwriter 505 shows a picture of a huge pre-historic avian creature that I find fascinating, like many the world over that seemed just to be massive birds with huge, dangerous beaks who had very few natural predators. I’ve been waiting for a post to bring me back to this blog and you have indulged me. Thank you. You are most welcome 🙂 Please visit often!